Tokyo is NOT New York City. It's big. It's crowded. It has bright lights and tall buildings. But it is NOT New York City. Tokyo is it's own separate, beast of a city. I was here for ten days - the first few days I was figuring out the city, then I thought I mastered it, only to discover I the final days I still had a lot more to discover. The closest Tokyo comes to feeling like New York may be in the Ginza neighborhood; there's a few other intersections in other neighborhoods that have a Times Square feel. While Tokyo certainly has distinct neighborhoods, which aggregate to a ward, it seems more like a city of train stations. The heavy stream of commuters creates a wave of activity, restaurants, and bars around the major train stations. If you wander off these major stations you can find a much calmer and quieter section of Tokyo. Tokyo has the largest metropolitan population in the world with over 35,000,000 people calling the Tokyo Bay area home. With Tokyo at the center of the metropolitan area additional major, however, cities such as Yokohama, Kawasaki, and Chiba had significant populations of their own. It's hard to imagine but even with ten days in Tokyo I did not venture to any of the surrounding cities - there was so much to see and explore just in Tokyo. You will not be able to see everything in Tokyo particularly if you time your visit to coincide with a sumo tournament so I think it's best if you figure out what the areas you want to see then spend time enjoying that area. Tokyo has the major Japan attractions of castles, temples, ninjas, etc. , however, there are much better examples of this culture in other areas. When you are planning a trip to Tokyo and once you arrive it's essential that you are able to orient yourself. Your head can start to spin about where to go, where to eat, and how to reach all those places, however, if you understand the metro system and how the city is organized it become much more manageable. 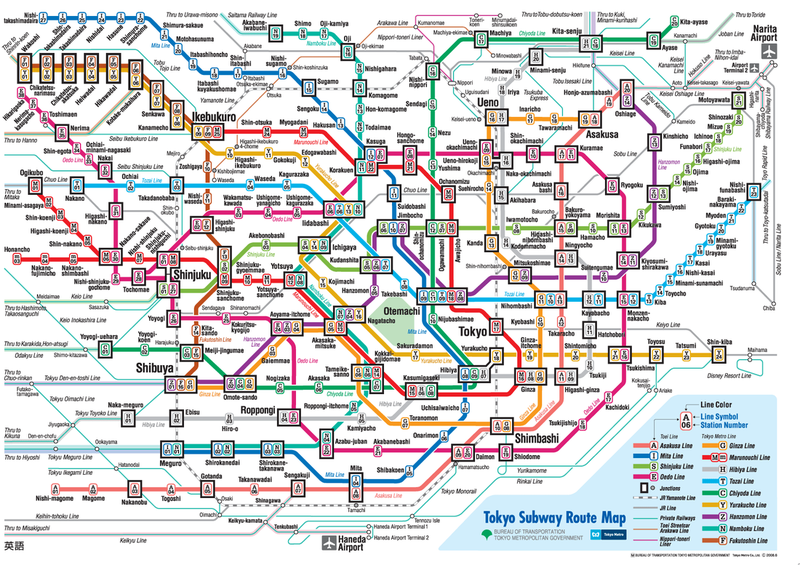 To orient yourself in Tokyo it's best to have an understanding of the train and subway transportation system. The metro map is overwhelming, but if you look closely, you will see a light gray and white line circling the center of the map. This is the JR (Japan Rail) Yamanote Line. Starting at the "one o'clock" position on the Yamanote Line is Ueno Station. Just south of the JR Ueno Station is Ameyoko, a warren of vintage and second hand shops and stalls under the Yamanote Train line. After work hours the yakitoris and bars fill up with Japanese businessmen making for great people watching. The Asakusa area farther east is an older section of Tokyo home to a few temples...however, if you are going to Kyoto, nothing in this area compares or is worth the visit - you'd be much better spending your time exploring other neighborhoods in more depth. Continuing clockwise is Akihabara, the Electric / Anime / Gamer hub of Tokyo. This neighborhood has buildings dedicated to old school arcades and towers that sell figurines of all your favorite old school Nintendo characters - it also has an unusually creepy aspect such as Maid Cafes and the AKB48 Cafe - creepy if you are a Westerner but perfectly normal if you are a Japanese business man. Ryogoku, home of the sumo competitions is just a few stops over. South is the Tokyo / Ginza / Hibaya section. I think this area is as close as Tokyo gets to feeling like New York, except for a few blocks in Shibuya and Shinjuku - blocks upon blocks of high rise office complexes, shopping, and pedestrian areas. There are lots of great yakatori restaurants under the JR Yamanote Line at the Yurakucho Station. You can spend a late night here and then catch a shorter cab ride to the early morning tuna auction at Tsukiji. At "five o'clock" is Shimbashi, a major train hub where you can catch the Yurikamome monorail line to Odaiba. In the seven and eight o'clock areas are Ebisu and Shibuya. If you head inwards (East) you will hit Omotesando (which is supposedly Tokyo's version of the Champs Elysees - there's trees and a Louis Vuitton but that's as far as the comparison goes) and eventually the Roppongi nightlife area. The Roppongi Hills section provides a great nighttime panorama of the city. If you head outwards (West) you will pass through the Naka-meguro and Shimo-kitazawa areas - hipster - Soho, Greenwich Village areas. If you are looking for a Sunday brunch head to this section of the city. Heading north from Shibuya the next few stations are all very busy. Shinjuku is a major business center but you also pass through Harajuku and Yoyogi, both which become very crowded on the weekend. Shinjuku has a busy nightlife and red light area but if venture northeast of the station there's a neighborhood with yakitoris filled with people getting off work. Shinjuku is supposedly the busiest train station in the world but I thought Osaka was busier. Shinjuku seemed much better organized - the subway and rail lines were in the same area vs. walking long distances to switch services. At 11 o'clock is Ikebukuro, a lighter version of Shinjuku. There's not too much time across the top section of the Yamanote Loop - as far as I know, I could be completely wrong. The Korakuen stop is home to the Tokyo Giants stadium and a mini amusement park complex. There's also a lot more historical sites within the JR Yamanote Line. I purchased a metro card from the Ueno JR Office - I believe they are also available for purchase at both the international airports. Having the metro card makes it much easier to move about the city because you do not need to worry if your route involves a JR line or a Tokyo Subway line - the card works on both services. You can use either Hyperdia or Jorudan to plan your route from station to station. Hyperdia is a bit easier for longer distances, outside the city limits, while Jorudan has more options - shortest, quickest, cheapest - within the Tokyo metro system. It's possible to take the metro to Narita and Haneada...but if you have an early morning flight you will need to take a cab or spend the night at the airport. Haneada has a new departure area and seems designed to accomodate people for the night - I spent six hours here from 11pm - 5am and found it to be very comfortable. Buy a Metro Card - from JR Office. Use website to map route. There's no bad spot, it depends, etc...I'll make this easy - if you are in Tokyo for a short time and cost isn't too much of a factor stay in Ginza. If you are in Tokyo for over a week stay in one of the hostels / capsule hotels in Ueno or Asakusa. In between look in the Ebisu area. The key consideration is obviously to be near a metro station, however, the metro stops running at midnight and cabs are expensive - you're more likely to spend late nights in Ginza or Roppingi Hills so staying in Ginza makes for an easier and cheaper route home. I found the For 91 Days Tokyo Blog to be better than a Tokyo Guidebook. If I have one regret about my stay it's not venturing into the Naka-meguro and Shimo-kitazawa areas earlier.